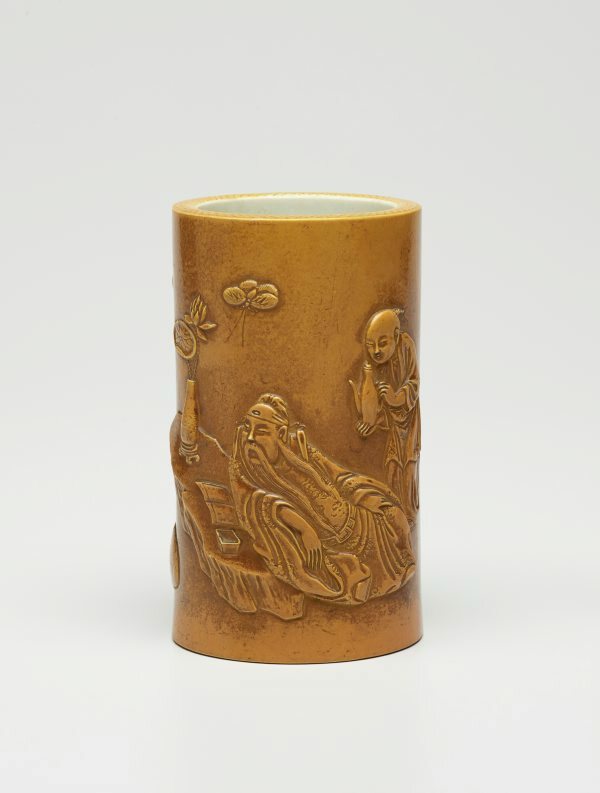 The yellow/brown glaze simulates carved bamboo. Such technical conceits, where one material was made to imitate another, were popular from the 1700s. The high-relief carved decoration depicts a gentleman with a long beard in official robe and cap, reclining against a flat-topped rock, upon which are a cup, a book and a vase. A young servant is seen squatting in front of him, ladling wine from a jar. 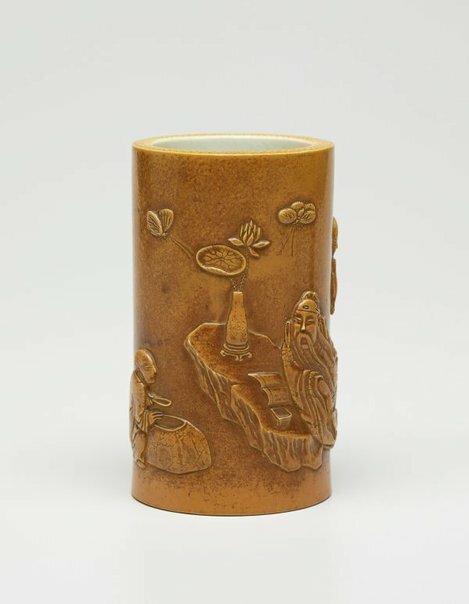 Another servant stands to the back, holding a wine flask. The scene represents the enduring pleasure enjoyed by an official scholar communing with nature and indulging in literary creation. The Asian Collections, AGNSW, 2003, pg.161. Art of the Brush - Chinese & Japanese painting calligraphy , Sydney, 1995, 11. Asian Collection Handbook, Art Gallery of New South Wales , 'Chinese Painting', pg. 42-52, Sydney, 1990, 42 (colour illus. ), 43. 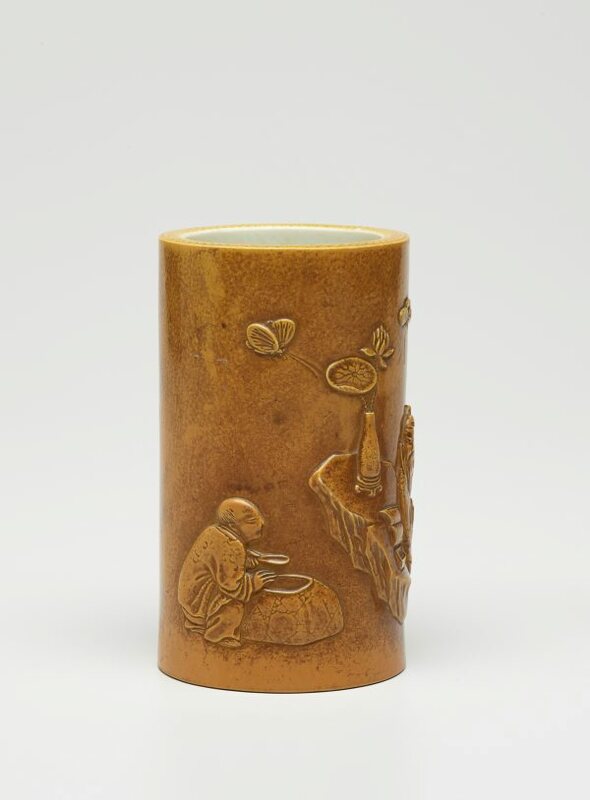 Late Chinese Imperial Porcelain , Sydney, 1980, 22 (Illus.). cat.no. 26. See 'Further Information' for text. The Asian Collections Art Gallery of New South Wales , 'The Scholar's Studio', Sydney, 2003, 161 (colour illus. ).